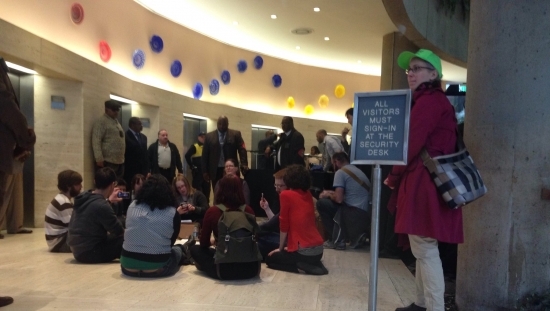 11 people were taken into custody and cited for disorderly conduct this afternoon for staging a sit-in and refusing to leave the lobby of Republican Senator Pat Toomey's Center City offices. The 7 women and 4 men were placed in plastic cuffs and led away after failing to disperse following multiple warnings. Thanks to legislation passed by City Council ahead of the Democratic National Convention last year, this is not an arrest or a criminal offense. They will be given a civil citation and released with a fine. The protestors were members of the group Tuesday's with Toomey, which has been holding weekly mid-day protests outside the senator's office building demanding that he hold a town hall meeting. The demonstrations have grown to include hundreds of people each Tuesday. Toomey held a "tele-town hall" earlier this month by telephone, but has not met with constituents in person since the elections. Senator Toomey's office will be moving to the Customs House, a federal government building in Old City, tomorrow. Watch VIDEO of the incident below. Religious leaders of all faiths stood together Monday afternoon to denounce the vandalism at Mt. Carmel Cemetery in the Wissinoming section of Philadelphia. Christian, Catholic, Jewish, and Muslim leaders condemned the acts of violence and hate and vowed to fight them together. They announced an interfaith event at Independence Mall on Thursday at noon called "Stand Up Against Hate." Today, hundreds of volunteers of all faiths and walks of life showed up at the cemetery to help. Organizers are staggering the volunteers in shifts to better direct the cleanup efforts. The investigation is on going. Philadelphia Police are searching for the nephew of a woman found dead in her Port Richmond home on Friday. 26-year-old Andrew Cruttenden is wanted for the shooting death of his aunt 57-year-old Virginia Cruttenden. Around 4 p.m. on Friday, February 4th officers responded to the 3200 block of Mercer Street. A family member had discovered the victim in the living room of the home with a gun shot to the head. The second floor had been ransacked and the family told police that items were missing. Andrew has a history of violent crimes. There is a $20,000 reward for information leading to an arrest and conviction in the case. If you have any information contact Homicide Fugitive Squad at 215-686-3068 / 3334 or call 911. UPDATE: U.S. 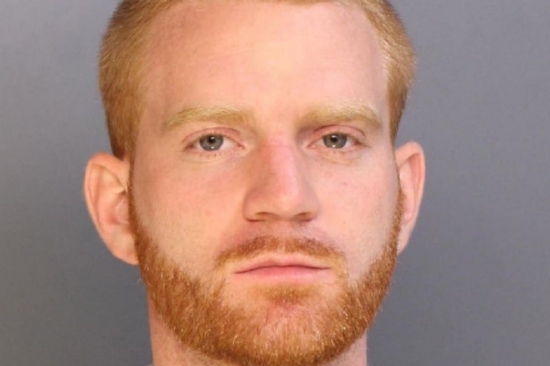 Marshals and Philadelphia Homicide Detectives took 26-year-old Andrew Cruttenden into custody around 4:30 p.m. Tuesday in the 2200 block of North Colorado Street.